Lourdes is a social anthropologist by training, originally from Guatemala. 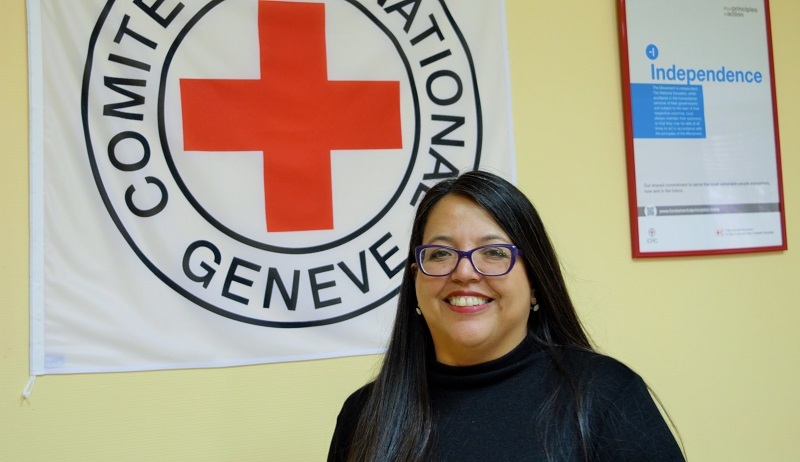 In her ninth year with the International Committee of the Red Cross (ICRC), Lourdes is now on her second mission in Donetsk, working as a forensic. Lourdes, tell us about your life before you joined the International Committee of the Red Cross? Guatemala, my home country, went through a 36-year long internal armed conflict, which ended in 1996. I was born, grew up and went to school in the conditions of conflict, whose intensity was going up and down over the years. During the conflict, an estimated 200,000 people were killed, and an estimated 30 to 40 thousand people disappeared; that is a very large number for a country of only 8 million people at the time of the conflict. I had always been interested in humanity and its various social and cultural aspects, which is how I ended up in anthropology studies. While at university, a classmate invited me to attend a training in human osteology carried out by an NGO focused on investigating what happened during the conflict, which included doing excavations and post-mortem analyses. It was a fascinating combination of human rights and practical application of science. In 1998, I joined an independent forensic team, and I spent the following ten years working in this field, which is how I became acquainted with the ICRC, as my organization was cooperating with the ICRC. When did you join the ICRC? In 2005, I was awarded a scholarship to do a master’s degree in forensic anthropology in the United Kingdom. After returning to Guatemala, I continued working for the forensic team, but at the same time I started to think about acquiring international experience. I started with the ICRC in 2010. My first mission was in Basra, Iraq, where I spent two years. The job was that of a forensic adviser rather than of a hands-on forensic, which was a challenge on its own; at the same time, I learned how to negotiate with the authorities and secure their support for our ideas and proposals. After Basra, I moved on to Pristina, Kosovo, from where I covered several Balkan countries. Then in late 2013, I went to Athens to provide support to the ICRC Antenna there which supported the national society’s efforts related to the needs of migrants coming to Europe through Greece. The six months I spent there had a very strong impact on me. When an emergency (conflict, natural disaster, migration crisis…) strikes, forensic systems of most countries would be unprepared to deal with such a large-scale challenge in an appropriate manner, and that was very much the case during the heights of the migration crisis. In 2015, I went for a short mission to Nepal, following the earthquake; it was good to see how the Red Cross Red Crescent Movement works together in emergency situations. Tell us about your work in Donetsk. I first arrived to Donetsk in 2016, and then I returned for a second mission several months ago. 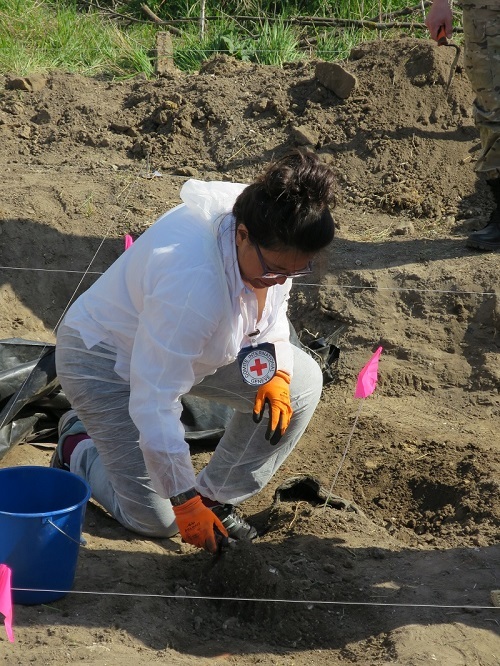 The challenges here are comparable to those of other contexts, and include making sure that the families are informed and involved in the process of searching and identifying the bodies, as well as assisting local structures to set up a proper system. What is it that draws you to the field of forensics, Lourdes? One reason is the possibility of using science to clarify the whereabouts of people and what happened to them. Being able to provide answers to families and give them a closure through this process is very rewarding. I find the forensics to be interesting because you can see how physical evidence can provide many answers… even only one bone from a human skeleton can give you so much information. Bones keep a history of your life and they exist for a long time after death. DNA samples taken from bones can help identify the person, but are normally used in conjunction with the analysis of the skeleton in order to provide a more definite answer. How is your life in Donetsk? When I arrived here first, it was in May and everything was green, and full of roses! Winter, however, is quite a different story. For me, coming from a warm region, anything colder than +15 degrees is too cold. There are things to do, such as going to the theater, opera, music…. The colleagues in the office are very friendly; around the city, the language is still a bit of a barrier, but I am learning it slowly. I am a friendly person, and people see that and respond in kind. What would you advise to those who consider joining the ICRC? For me, the ICRC is the best place I have ever worked at. Getting to meet different people from so many contexts and backgrounds is inspiring and educational at the same time. To be with ICRC, you need to have an open heart and mind. Every context is different, so it is very important to adapt.